Download and run it for free ! Pad format file is available for software sites to automatically parse product description into their freeware directory. 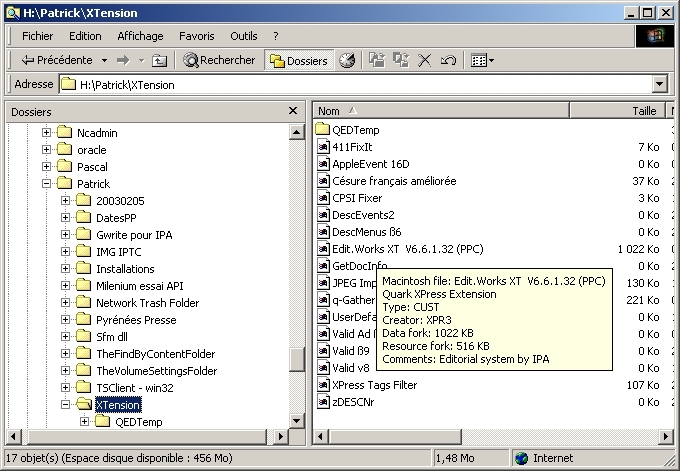 MacInfoTip is a free Windows shell extension to quickly display Macintosh files information in tooltips of your Windows Explorer (the yellow balloons that pop up over a file) each time you browse folder content. As it recognizes common type of files, the program also displays a suggested extension that you can add to the filename enabling Windows to identify associated applications and easily open it using Windows double-click. - any version of Windows XP. Runs on file servers managed by standard Services For Macintosh (SFM), ExtremeZIP or MacServerIP. In order to preserve and not interfere with tooltips displayed by Explorer according to Windows extensions, MacToolTips displays tooltips only for filenames without Windows extensions. On Windows, it will not run when a Macintosh filename contains invalid Windows character (like ?, /, \, *, etc.) - see MacNames for an easy way to convert them into Windows valid names automatically, MacExplorer (free) program to read Mac files on Windows 2000 or XP, MacVolumes (free) to get statistics helping you in Macintosh volumes optimization. MacNames : software application to rename automatically Macintosh files stored on a Windows NT/2000 Server, transforming invalid characters and adding three-characters extensions to Mac file names. Delenda: program that will search the drive/folder for files not accessed in the last x amount of time and archive non-used files to archive folders or delete them. Kalimages : application to create automatically an image database with keywords and all annotations indexed for search purposes.